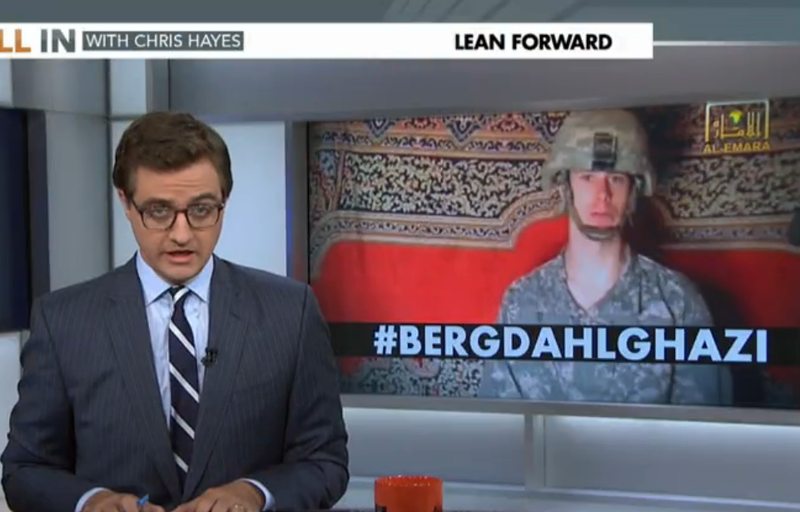 The Amazing Chris Hayes said on his Twitter feed that he was going to address many of the arguments raised by those who criticized his obtuse political hackery over the Bowe Bergdahl contretemps. Needless to say, I was pretty excited to watch his show online this morning. * After all, I’ve been assured time and again that he’s an honest interlocutor! A real decent guy who takes time to consider all sides of the option and lay out all the facts. Sure, he might be liberal, but he’s "fair" and "open-minded." Nothing screams "I’m taking this debate seriously!" like titling your segment #Bergdahlgazi. Shows a real intent to fairly discuss the issues at hand, you know? Regardless, I figured I’d watch the segment. And boy was I impressed! First he starts off slamming Republicans for flip-flopping on the release of Bowe Bergdahl. They were for it before they were against it! He got you good, you f—ers! Of course, not addressed in this tricksy little montage is the fact that, following his release, we were treated to a bunch of new information about Bergdahl and his (alleged!) desertion, his (alleged!) efforts to seek talks with the Taliban after his desertion, and the deaths of the multiple Americans who were ordered to seek the (alleged!) deserters safe return. Frankly, were I any of these elected officials, I would have "flip-flopped" too. And were I any of their constituents and they didn’t "flip-flop," I would have held it against them. Then there’s a pro-forma line or two from Obama and his officials about how we "never leave a man behind." "Full stop!" the president lectures. This is a bit of begging the question, of course, as virtually no one wants for the (alleged!) deserter to have been left behind. I have yet to talk to someone who would have disapproved of, say, a special forces assault on his captors to retrieve him. They were simply asking whether it was worth giving up five extremely dangerous terrorists to get him back. "There you go again, using that word ‘terrorists,’" I can practically hear The Amazing Chris Hayes and His Coterie of Gibbering Sycophants sputtering. Because Hayes next "dismantled" the idea that these Taliban commanders are "terrorists." Oh sure, he allows, they were "bad dudes." But terrorists! Pshaw! Just POWs, like any others. They are covered under International Law, Which Is Totally a Real Thing. They were, in fact, just patriots defending their homeland from American aggression! Sure, he admits later on, they may have fought with al Qaeda. But he doesn’t really detail what they’ve done because, my, would that be damning. Let Thomas Joscelyn help: One of these dudes murdered "thousands of Shiites" and worked closely with the commander of "al Qaeda’s main fighting unit in Afghanistan prior to 9/11"; one of these dudes "fought alongside al Qaeda as a Taliban military general" (he’s also wanted for the murder of thousands of Shiites); one of these dudes "arranged for al Qaeda members to provide crucial intelligence training prior to 9/11"; one of these dudes "was likely a major drug trafficker and deeply in bed with al Qaeda" and "allegedly oversaw one of Osama bin Laden’s training facilities in Herat"; and the last of these dudes "had strong operational ties to Anti-Coalition Militia (ACM) groups including al Qaeda, the Taliban, the Haqqani Network, and the Hezb-e-Islami Gulbuddin." "Don’t call me a terrorist, bro!" you can imagine these five heroes of the Afgahn resistance imploring. "I’m an al Qaeda-aligned war criminal. Big difference." So, if we wanted to be super-accurate about it, we wouldn’t say that the Obama administration negotiated with terrorists to retrieve a POW. No no. We’d say that the Obama administration negotiated with a terrorist-designated organization and handed over al Qaeda-aligned war criminals in order to retrieve an (alleged!) deserter whose actions led to the death of six Americans. When Washington, Lincoln, and FDR (he means Truman, actually) released enemy prisoners, they did not return to the battlefield because there was no battlefield to which they could return. The wars were over. The enemy had surrendered. The Taliban and al Qaeda have not surrendered. The president of the United States cannot will a war to end if the other side does not agree. The enemy gets a vote. Of course, Hayes just kind of brushes aside as insane political hackery the idea that the Obama administration might’ve broken the law by ordering the release of Gitmo-inhabiting al Qaeda-aligned war criminals. This despite the fact that noted rock band patriarch Jay Carney assured reporters last year that Congress would have to be consulted before any deal was made because, in fact, that’s what the law requires. But don’t take my word for it; I’m just a partisan hack, after all. Instead, let’s ask California Democratic Senator Dianne Feinstein! "It comes to us with some surprise and dismay that the transfers went ahead with no consultation, totally not following law," Feinstein told reporters following a closed door meeting. "And in an issue with this kind of concern to a committee that bears the oversight responsibility, I think you can see that we're very dismayed about it." Ugh, why does she hate this president so much? And why are other smart Democrats such as Hillary Clinton throwing this administration under the bus by leaking their strenuous opposition to this horrible, no good, very bad deal? They should be ashamed of themselves. 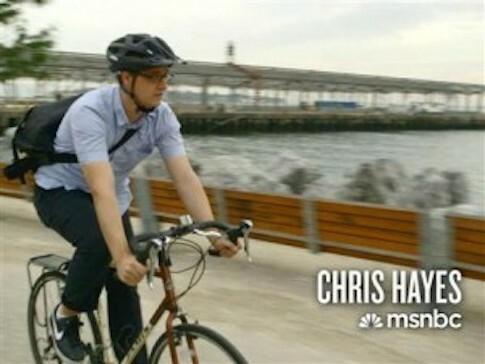 I wonder if Hayes asked Michael Tomasky about this betrayal by the Democrats in his next segment, during which the Daily Beast editor and noted American hero answered the big questions that Hayes wouldn’t bother asking, you know, the guys who actually served with Bergdahl and think he’s a treasonous deserter. I write "I wonder" because, good lord, I’d rather rip my eyes out than watch that segment. One can only take so much of the gibbering sycophants. I am clearly not alone. One can't help but think there's a reason MSNBC is the least-trusted name in cable news. *I, like virtually every single other American, had better things to do than watch his show live, of course. **I’m simplifying a bit here, as it is unclear whether or not Bergdahl was literally in the clutches of the official "Haqqani Network" at the time of his release. But my sources*** assure me that this is a distinction without a difference. ***What? I have sources. I wasn’t always a mere editor and America’s greatest film critic, you know. #Journalist. This entry was posted in Culture and tagged Al Qaeda, Barack Obama, Chris Hayes, MSNBC. Bookmark the permalink.